The rapidly growing Icelandic LCC WOW air began a new chapter in its short history on 9-Jun-2016. Just over four years after its inaugural flight – from Reykjavik to Paris on 31-May-2012 – the airline has launched its first widebody service from Reykjavik to San Francisco. This route will be joined on 15-Jun-2016 by a Los Angeles service, also deploying A330-300 aircraft and taking its North American network to six destinations. With 20 European destinations it is developing a role as a provider of low cost trans-Atlantic connecting services to sit alongside its point-to-point offering. In this respect it is providing growing competition to its larger compatriot Icelandair, which is also growing fast (and profitably). However for now, at least, there appears to be room for both: Icelandair is not present on 12 of WOW air's European city pairs, or on three of its North American routes. Certainly the North Atlantic needs new competition, and both Icelandic airlines are helping to provide it. 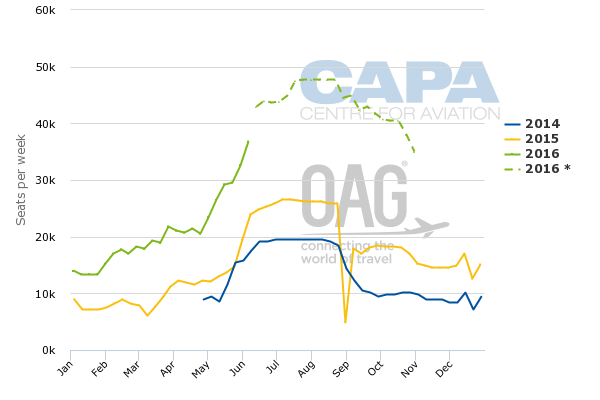 According to schedules data from OAG, WOW air increased its seat capacity by 46.5% to 0.8 million in 2015, after growing by 23.6% in 2014. Full data for calendar 2016 are not yet available, but WOW air appears to be on course to operate double its 2015 seat capacity in 2016. In ASK terms the increase will be even greater, thanks to the launch of its two new US west coast routes. 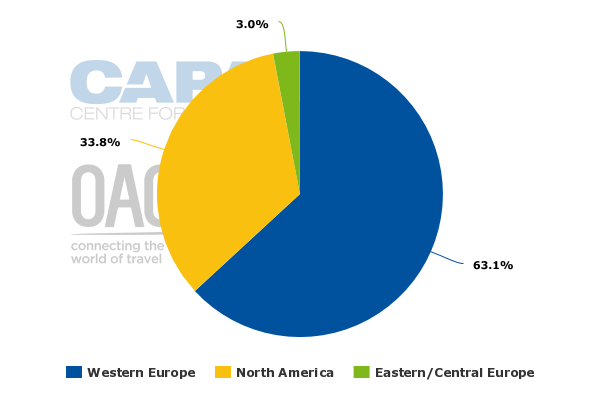 WOW Air's network is still skewed towards Europe, which accounts for 66% of its seat capacity in the peak summer 2016, according to OAG data for the week of 1-Aug-2016 (63% Western Europe and 3% Eastern/Central Europe). North America accounts for 34% of its seats, compared with 17% in Aug-2015. 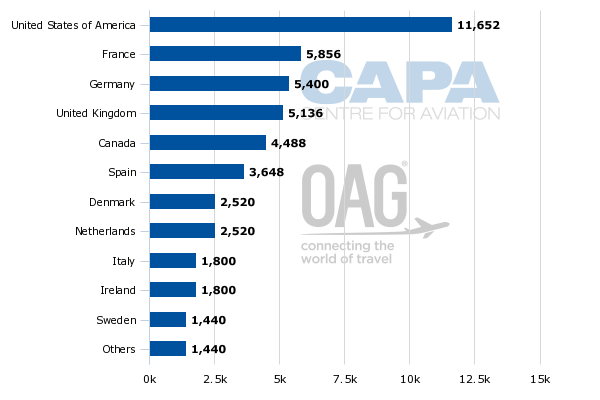 The United States is the most important destination country for WOW air this summer, with the airline deploying double the seat capacity to the US compared with its number two country, France (closely followed by Germany and the UK). The airline's focus on the larger nations of North and West Europe appears to be driven both by their importance as O&D markets in their own right and by their geographical location, which means that connecting flights to/from North America via Iceland are less of a detour than from southern Europe. WOW air has 21% of seats at Reykjavik Keflavik Airport this summer, placing it at number two behind Icelandair, which has 58% (week of 1-Aug-2016, source: OAG). The German airline, airberlin, is a distant third, with 3% of seats. SAS is fourth and Delta, the only US airline at the airport, is fifth. After WOW air the next biggest LCC is easyJet, ranking sixth with a seat share of 2%. Icelandair and WOW are the only airlines at Keflavik that operate to both Europe and North America. The effect of LCC growth on routes to/from Iceland appears to have been to grow the overall size of the market, including the market for trans-Atlantic connecting services. The number of connecting opportunities offered by Icelandair has increased significantly since WOW air's entry into the market. Based on OAG data for the week of 1-Aug-2016 WOW Air will operate 26 routes from Reykjavik this summer, of which 20 are to Europe and only six to North America. However, the six North American routes all rank in the top half of WOW air's route list by seat numbers, including four out of its top six routes. The list of 26 routes includes nine launched in summer 2016 (San Francisco, Los Angeles, Toronto, Frankfurt, Montreal, Stockholm Vasteras, Bristol, Edinburgh and Nice). There are also five routes that were only launched in summer 2015 (Boston, Baltimore/Washington, Dublin, Tenerife-Sur and Rome Fiumicino). This means that more than half (14) of WOW air's routes have been launched since the start of summer 2015, including all six of its North American routes. WOW air's route list includes the major European hubs Paris CDG, Amsterdam Schiphol and Frankfurt, as well as SAS' hub at Copenhagen and smaller hubs such as Dublin and Rome FCO. These may help to generate some feed into its network from other destinations across Europe and, possibly, the Middle East and Asia. However, WOW air does not operate any interline agreements with other airlines, so any such feed is likely to be relatively small. WOW air's North American route list includes the US and Canada – both the east and the west coasts. Among its 20 routes to Europe WOW air is the largest airline by seats on 10 and number two on 10 (based on city pairs). On five of the routes where it is leader, it is the only operator. WOW air competes with Icelandair on eight routes (on six of these, Icelandair is bigger than WOW air). It competes with Germanwings or Lufthansa on all three of its Germany routes, and with easyJet on its three UK routes (from Sep-2016, when easyJet will re-enter Reykjavik-Bristol). It also competes with the Riga-based Primera Air Nordic on three routes. WOW air is the leading airline by seats on four of its six North American routes, including three that are monopolies – San Francisco, Baltimore/Washington and Los Angeles. On the three competitive routes (Boston, Toronto and Montreal), it operates a duopoly with Icelandair. WOW air deploys A321 equipment to Boston, Baltimore/Washington, Toronto and Montreal, while its two new west coast destinations – San Francisco and Los Angeles – are to be served with A330 widebodies. 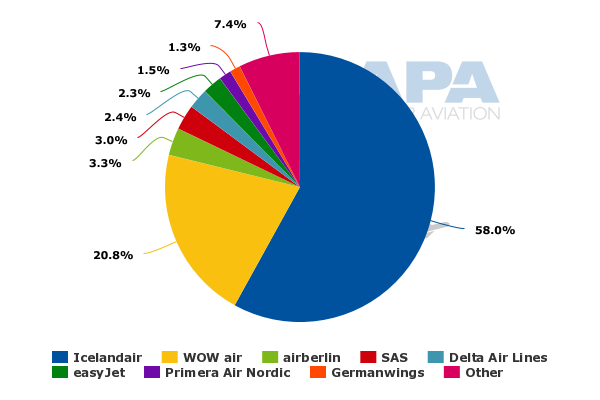 According to the CAPA Fleet Database, WOW air operates a fleet of seven leased A320-family aircraft with an average age of 3.2 years, as at 10-Jun-2016. This consists of two A320s and five A321s. It has orders for one A320neo and one A321neo for delivery in 2017 and 2018. It has reportedly signed an agreement with Air Lease Corporation to lease five A320-family aircraft (of which one was delivered in May-2016) to facilitate its expansion plans. From Jun-2016 WOW Air is now phasing in three Airbus A330-300 aircraft fitted with 340 all-economy class seats, to operate Reykjavik to San Francisco and Los Angeles. When naming its first A330 aircraft TF-GAY for deployment on the San Francisco route the WOW air CEO, Skuli Mogensen, said: “We wholeheartedly support queer people’s fight for rights. Just as we support equal rights for everybody, no matter their gender, religion, ethnicity or culture. The carrier expects to operate the aircraft on its Reykjavik Keflavik-San Francisco service". WOW air has achieved much in its first four years of operation, under the guidance of CEO and owner Mr Mogenson. Although competition with Icelandair's successful and profitable network may increase over time, there appears to be scope for both to grow. WOW air's new widebody routes may meet with some teething problems, as is often the case when airlines take on a new type of operation, and it could be argued that a fleet of only three A330s is subsized in terms of economies of scale. However, so far WOW air's development has been impressive and the North Atlantic – dominated as it is by the immunised joint ventures within the branded global alliances – is a market crying out for new entrants with innovative business models.